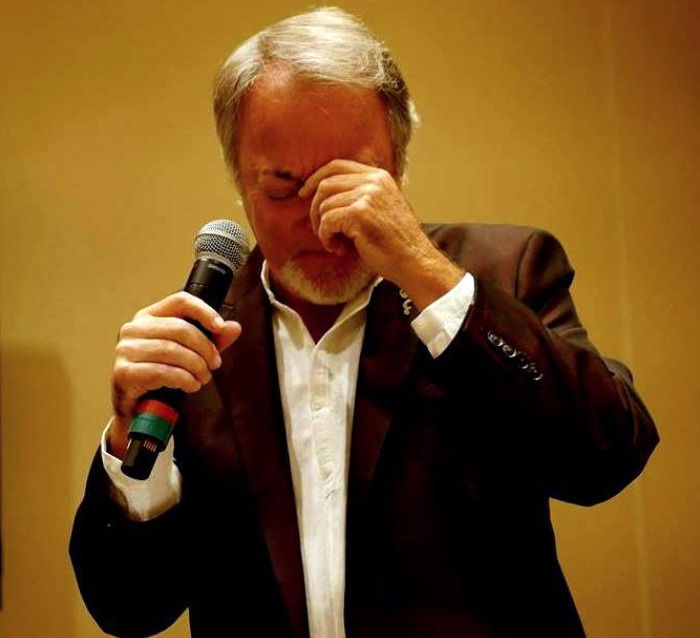 While speaking from his PowerPoint slides, Mark would sporadically close his eyes, hold his forehead as if in deep concentration, and claim he was in contact with a deceased relative of someone in the room. Then he would tell a workshop participant some impossible-to-know piece of information about his or her life. Even knowing this was some sort of trick—rather than “the real deal”—this was impressive. 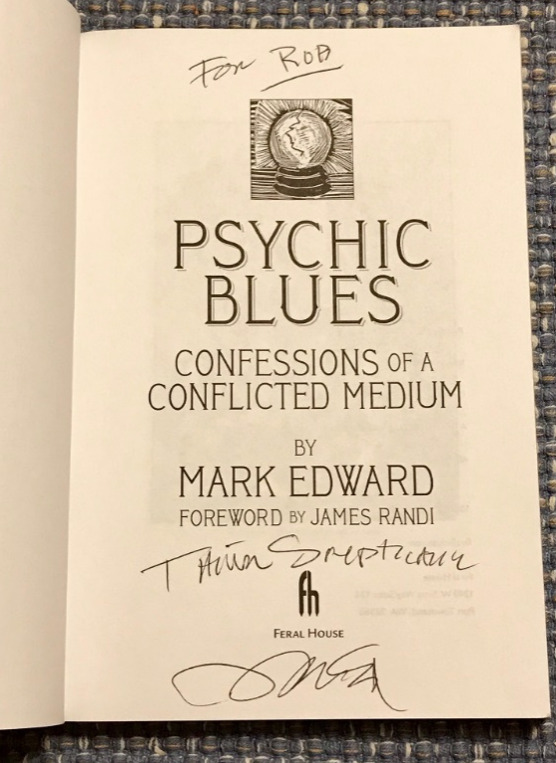 Having been suitably impressed by Mark’s workshop, one of the books I purchased at CSICon was his: Psychic Blues: Confessions of a Conflicted Medium (with a personalized autograph, of course). In its pages I learned of Mark’s interesting past and got the inside scoop on the sordid psychic trade. Little did I know (hey, I’m not psychic) that I would soon become a Skeptical Inquirer online columnist and would interview him for an article. Now, if Mark had made that prediction about me in 2017, I might not still be a skeptic! Rob Palmer: Mark, please introduce yourself and give us a bit about your background. 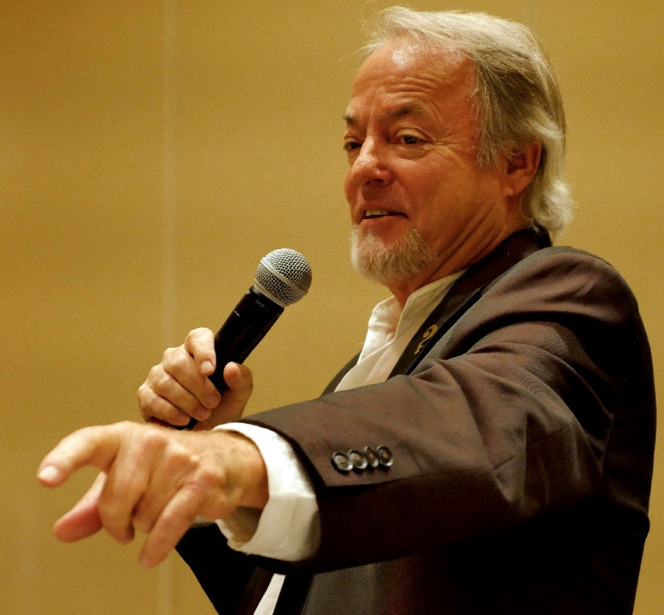 Mark Edward: I’m a professional mentalist, specializing in magic of the mind. I have written books on mentalism and séance theory and production and appeared on television as both primary consultant and on-air performer. My skeptical history goes back to the early 1970s, when I became involved with searching out the methods of Uri Geller. 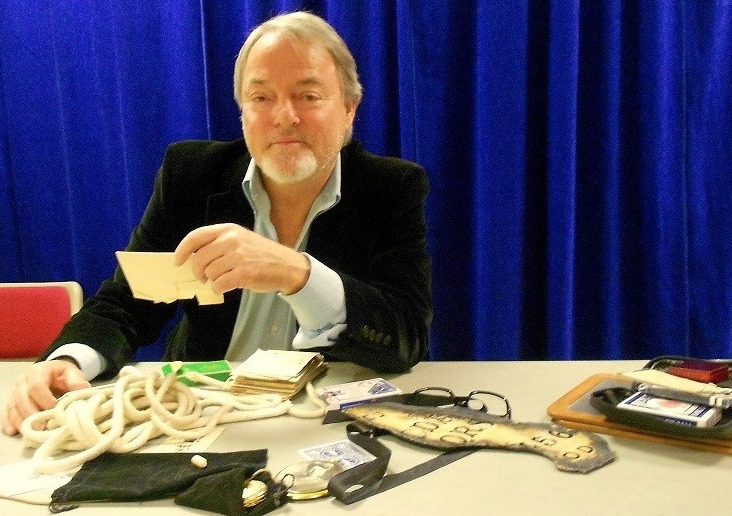 At that time, I lectured and taught magic classes for the California Skeptics Society. Edward: There’s nothing lucky about what happened here. The most likely circumstance is … since they had a prior “friendship,” it wouldn’t be surprising that the psychic knew about Mary’s mother, was privy to information Mary may have let slip but completely forgot about. … Psychics have very good memories, take copious notes, springing into action with this information when the moment presents itself. Her “psychic friend” may also have other “clients” that knew Mary, and they unknowingly provided this … information. Palmer: When I read Psychic Blues I learned you were a psychic on the Psychic Friends Network and also did readings at parties. I believe you said you began to wonder if you had real psychic powers because you were being so accurate and you had to fight to stay humble. Am I recalling that correctly? Edward: I never began to believe I had psychic powers of any sort! In Psychic Blues I merely mentioned the fact that when you immerse yourself in the psychic marketplace and begin to get testimonial letters and gushing accolades from total strangers who go out of their way to promote your godly “gift,” it can begin to turn your head. Without a solid underpinning of skepticism and critical thinking (in my case brought about primarily by my background in magic and mentalism), it would have been easy to fall prey to this sort of false imagining. So no, I never fell under my own illusions. I was on a mission to find out how I could scam the scammers and steered clear of “the woo” as best I could, taking it all with a healthy grain of salt. Palmer: In Blues, it seemed like you were on the fence about the reality of at least some paranormal phenomena. Was I off base? Edward: Honestly, I don’t consider myself a total skeptic and have always preferred to have an open mind to such things. This is not being on any fence. To my way of thinking, this is no different than choosing to remain an agnostic rather than assuming the stance of an atheist. Also, it’s my theory there are some things we just don’t know, and it’s arrogant in the extreme to judge something we know nothing about without applying basic evidentiary science to each situation on an individual case-by-case basis. Broad brushes are not my thing. I am doing “that sort of work” every time I go out on stage or investigate a so-called psychic or medium. After all, I’m a magician at heart. In my character as a mentalist, it becomes my job to engender a certain level of belief. If you don’t have some belief that what you are doing or witnessing might be real, mentalism doesn’t work. It falls flat. … In many ways, you need to experience for yourself what the effect on an audience can be after you perform the simplest magic trick and call it a supernatural phenomenon. People want to believe, and belief is everything! … It’s not my job while in character to educate people! If I’m tasked to do a skeptical or educational event, I’m happy to do that as well. Palmer: How has your opinion of the possibility of paranormal abilities changed over time? Edward: Thirty-five years ago, I might have entertained a vague disposition toward wanting to believe in such rubbish, but many years of excellent mentalism teachers and training taught me to see things differently, and I quickly learned I could do exactly the same sorts of “phenomena” that was going around at the time. These days, I’m mostly watching from the point of view of things (or “bits of business” in magic jargon) I can learn from the situation or performer’s individual style of presentation. … Although sometimes it can be excruciating to witness, I enjoy the performance and clever or cunning devices or expedients used to trick or deceive others that the best (or worst, if you will) exponents of this odd behavior exhibit. I can appreciate what they are suggesting but despise the effect it can have on people who don’t understand it’s an illusion and throw their money away on what they think is an answer to their bereavement or loss. That’s why I titled my book Psychic Blues. This latter aspect is the Blues part of the whole deal. It’s the sad part when it’s clearly not entertainment but abuse and crude psychological manipulation. I feel in so many ways, humanity has lost any ability to simply listen to each other; unfortunately for right now, charlatans and crooks masquerading as psychics and mediums are filling that void. Palmer: Were you aware of the skeptical movement when you worked as a psychic? Edward: Yes, I want to once again make that clear. I have always been a skeptic! When I wrote Psychic Blues, it was out of outrage against what I was seeing as a skeptic and mentalist. I saw so-called celebrity psychics using the crudest forms of magic trickery, such as fake blindfolds, billet switching (search Google if you want to learn more) and other “skills” to hoodwink the unwary. All the time I was carefully referencing the past researches of people like Houdini and Randi. When I saw how easy it was to project this kind of performance demeanor, and knowing 95 percent of the loser-psychics I had met along the way had little to no training in stage presence or public speaking, I began a personal endeavor to do everything I could to infiltrate the huge psychic marketplace and try to understand what they were doing and how they were becoming so popular. I decided before I began writing Psychic Blues that I would attempt to get under the skins of the biggest crooks I saw on the horizon and use all of my skills as a magician/mentalist to convince them and the believers I was the real deal. It was easy, and I continually course corrected my undercover subterfuge until I was tagged by them as one of the greatest psychics in the world! No kidding! They fell for it just like millions of believers fell for their product. If they knew I was a mentalist and playing them, they never mentioned it to me. I suppose either way to them I was an asset, but eventually someone had to spill the beans. All this time I was on the Editorial Board of Skeptic magazine. Michael Shermer had a few moments of disgust with my plan, and for quite a few years I became “The Dark Side of Mentalism” and the sworn enemy of both skeptics and believers, doing a balancing act on this treacherous fence, but I saw my method as totally necessary. You can’t just walk up to a psychic or medium on the street and ask, “How did you do that?” Like magicians, they can be a tight-knit group full of jealousy, greed, and their own personal methods and attitudes. I had to slowly ingratiate myself and wheedle my way to the top of a very slippery slope. It took some hard work and many were the times I had to hold my nose and keep the endgame in mind to get through it. But I managed to muddle through, and despite what my detractors may say, the ends justified the means. Psychic Blues speaks for itself. I have continued to refine my methods and actions to reflect my original concept: fight fire with fire. Palmer: Bob Nygaard, the private detective I interviewed for Skeptical Inquirer online about his experience with psychic fraud (see here), told me he gets four or five requests for help every day from victims who have lost substantial sums—sometimes their entire life savings—to psychic con artists. The magnitude of this problem is simply enormous. It’s my opinion that the high-profile “psychic mediums” such as John Edward, Tyler Henry, Chip Coffey, and the deceased Sylvia Browne—and the media outlets who promote them—are partly to blame. The media spotlight on these famous psychics lends credibility to the already widespread belief that psychic powers and mediumship are real. I think that this directly leads people to fall victim to unscrupulous neighborhood psychics. Nygaard said he agreed with this. What do you think about this trickle-down hypothesis? Edward: It’s no trickle; it’s a tsunami of media exploitation and ratings battling that shows no sign of abating. We no longer have the clear choice of knowing what is fake and what is real. When I was a kid, I grew up watching programming like The Twilight Zone and The Outer Limits, wherein psychic things were clearly shown in a fictional dramatic setting. Now we have so-called “reality television” which, when looked at skeptically, has no reality at all. What may seem like reality is carefully thought out, and although there is no script, no real actors, no directors, and no sets or sound stages, the perception that what we are watching must be real is about as far from the real world as we can get. We may buy into it because it’s packaged and produced to appear real, but we have to remember the editors and the agenda set forward by these producers as to what exactly they are foisting upon us. It’s my contention that because of so many decades of paranormal television programming that started back in the early 1960s with shows like The Twilight Zone and The Nightstalker, then later with Buffy the Vampire Slayer, The X-Files, and sliding into Ghost Hunters and Hollywood Medium and on and on, we have slowly crept into a world where anything goes. I have met people who truly don’t know any better than what they saw on the Long Island Medium. I once met a security guard who was dumbfounded when I told him Ghost Hunters wasn’t real. He asked, “You mean ghosts aren’t real?” This is a man who carries a gun, votes, and accepts what was once a fiction as “real.” Otherwise intelligent people like this believe in ghosts based solely on these later televised reality examples. If we give these kinds of “entertainments” a platform, should we be surprised we now have flat-earth believers? Don’t get me wrong, I love the earlier shows mentioned; it’s just gotten way out of hand. Censorship is not an option; critical thinking is needed even if it’s in small doses. Humor helps. Watch the segment John Oliver recently did on psychics. Brilliant. Palmer: It seems that people on some level want to believe this. What can, and should, be done to change this? Edward: It might be too late. I hope not. But there is no one single answer. If I had it, I would gladly tell you. We are in up to our eyeballs in fraud and corruption. Psychics and mediums are probably the least of our problems. In addition, we must remember psychics and mediums have been plying their trade since the beginning of time, so if anything were to change, it may take generations of rational and critical work to settle the dark waters that are continually being swirled and muddied. Yes, people want to believe, but by default the very people who maintain the highest positions in our society are beginning to see lying and deception can only be seen for what it is if we can get beyond our predilection to think something outside ourselves is going to save us. That’s a big leap. That’s why people seek psychics and mediums. I can’t do much about the rottenness of the Big Picture, but I and others I work with know if we can put our best efforts into activism that exposes the lower spectrum of the lie culture (psychics and mediums), we can make a difference. We have seen it happen many times. Start with what you can put your hands on and it will grow and eventually be noticed. I have to believe that. Join a local grassroots skeptical group and do something! Palmer: Let’s talk about your new book. How is this edition of Psychic Blues different from the original release? 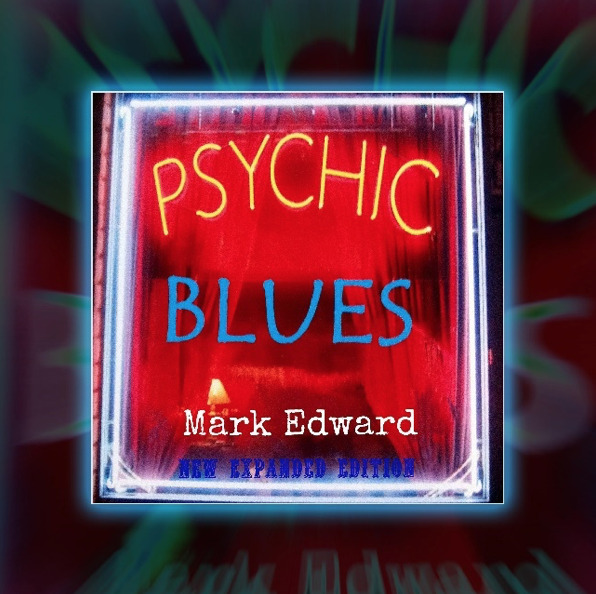 Edward:The new audiobook of Psychic Blues—New Expanded Edition has now been released by Amazon/Audible. This expanded version differs from the original paperback book first published by Feral House in 2012. The original book was substantially edited by the book’s publisher to reflect the darker side of the psychic image and more of an anti-hero edge to the main character (me). I re-thought the entire project and reverted to the original manuscript submitted to the publisher. The new expanded audio version is read personally by myself, directly from my original manuscript. This time it’s funnier and more nuanced, with all voice impersonations of sitters, agents, and psychics provided by me. It’s still a dark-humored peek behind the curtain at the world of the “professional psychic,” but it’s been fleshed-out to make the main protagonist a little more human—and with a wonderful introduction by James “The Amazing” Randi. Palmer: How did doing the new version—in audio no less—come about? Edward: I wasn’t completely happy with the original published book for the editing and other reasons mentioned above. Some of the reviews I read were of the opinion I was a pretty nasty character because that’s how it was edited. Some wanted to know more about what my personal life was like at the time, what my inspirations were to do such a thing, and other more personal details. Most of that was in the original manuscript. Wherever I went, people had asked for an audio version, so I decided to give it a try, reading from my original words and adding in some music cues and sound effects to make it more interesting. I’m very happy with how it all turned out. Palmer: What other books have you written? What is currently going on that’s new? Edward: I have many other books written for magicians and mentalists; the latest crop can be viewed on my website. In December of last year (2018), I released a hardback edition of a book of my best séance secrets through my UK publisher, Inner Rapport. Total Darkness is an exploration of psychological storytelling through séance effects I have built and used for many years of performing. You can read all about it, including reviews, on my website. Also, Susan Gerbic and I worked together as a team to create an airtight psychic-medium sting. … We are both very excited about this because it demonstrates conclusively how psychics and mediums use social media to their advantage. One of our favorite lines we hear all the time is, “There’s no way in the world that psychic could have known that!” Please watch for the New York Times magazine article [issue dated February 26, 2019] about our sting operation and you will read for yourself how it’s done and how you can uncover your own local fraudster by applying the same protocols. As mentioned above, while I was completing this article, the news broke about the successful sting (dubbed “Operation Pizza Roll”), which was run by Mark Edward and Susan Gerbic against “psychic medium” Thomas John. This was documented first in a Skeptical Inquirer online article and then in The New York Times Magazine. Also, Thomas Westbrook produced a documentary of the sting for his “Holy Koolaid” YouTube channel. It juxtaposes audio of John doing his “reading” of Susan and Mark (who were using undercover identities) with selected screenshots of the faked Facebook information in their undercover accounts. Thanks to a wonderful editing job, what happened is unambiguous: Thomas John (or his staff) read the made-up information in the faked Facebook accounts, and John recited it back during the reading. Or maybe spirits read the bogus Facebook info uncritically and told it to John. Or, maybe the spirits knew it was a sting but don’t like John, so they fed him the false info to make him look like a con artist. Hmmmm. We report … you decide. Susan and Mark were unaware of the detailed information in those Facebook accounts. So, no, TJ, you can’t claim you were reading their minds. If you could do that, I think all you would have gotten was some stifled laughter and maybe a suppressed “We got you!” And as if all that were not sufficient evidence that Thomas John’s claimed paranormal gift is, at minimum, somewhat flawed (leaving him vulnerable to mischievous spirits helping skeptics embarrass him), Susan Gerbic has also published another article about John. In it, she reveals that the “unsuspecting passengers” in John’s ride-share “reality” show on Lifetime TV, Seatbelt Psychic, (where John gives his riders messages from the dead) are actually hired actors. They even show up on IMDb. You just can’t make this stuff up, folks! Oh wait—they did! Acknowledgements: I want to thank Mark Edward for his participation in this interview, and for his skeptical activism. You can read more about him in his Wikipedia article and visit his website, which contains numerous videos, including his appearances on Adam Ruins Everything and Brain Games.